Monday has rolled around again, all too soon. With all of enthusiasm and fervor that the early week usually brings perhaps you've decided that today is the day that you will kick start you fitness regime (again). Or maybe you are sitting at work reading this thinking of an excuse not to go to the gym or to that spin class tonight that you actually really enjoy when you are there; and certainly feel the benefit of once done. We've certainly all been there. Before you think this is about to degenerate into some sort of list of the many and varied health benefits of exercise or tell you how good you'll feel after you've trained, it is not. Unless you are a committed couch-driver I am sure you've felt the physical and mental high that you ride post a workout. Enough ink has been spilled and hot air blown on the all the health benefits to allow anyone to write to your own book. Instead I thought I would give you a few early week thoughts on what works for me when I need a little motivation or focus with my training. 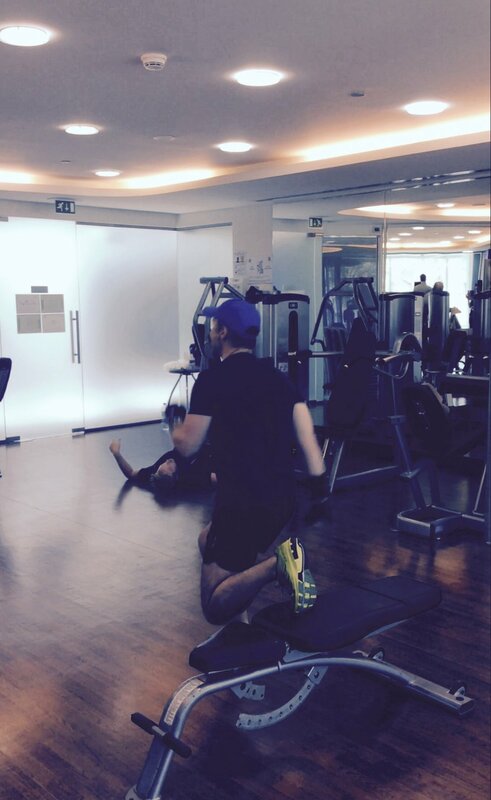 Being a personal trainer here in Abu Dhabi means that I spend an awful lot of time in the gym. Finding the motivation to arrive early before my clients or stay and train myself after 3 hours of back-to-back PT sessions is serious a challenge. So here's a few ideas of things that work for me to keep me focused and motivated. As they say, to fail to plan is to plan to fail. Well, maybe it is not quite that drastic but I always make sure I have a plan. I know what part of my body I am going to train. I know what type of exercise I am going to do, how many sets, how far I will run/ row etc... This really helps focus, allows you to methodically work through your training and ensures that your workout actually gets done. Mix it up. Any sane person gets bored with repetition. I often take my workout outdoors. This is getting harder here as the temperature heats up but if you can get out early then it's still bearable and training at sunrise is such an awesome start to the day. Early wake-ups are never pretty but morning training starts your the day on the right foot. The thought of training is not hanging over you all day long and start the day with a sense of achievement in your back pocket. That's powerful. If you are in the UK you now have the benefit of long evenings and (hopefully) consistently ok weather, so really make the most of it during the summer months. Training with a partner is always great for motivation. If you are training with someone else agree to plan a session each and alternate it each session. Train with your other half if you can. Matt and I train together once a week, usually at the weekend because we both have such busy schedules. This time spent together on a shared pastime, hobby or whatever is a great way to enhance the bond in your relationship. There is something about working together to look good for each other as well as just yourself. Check out my video of Matt nailing the sprinter lunge on my Instagram @PIPERRYAN (try it, it's actually harder than it looks...and it looks hard!). You don't need an hour day. Who has that much time to dedicated to exercise everyday anyway? Set aside 20-30 minutes each day and get moving. A HIIT workout (jump on a treadmill - 20 seconds on, 40 off, repeat for 20 minutes increasing speed and incline) or 3kms around the park while the kids play. It really doesn't have to be a chore, find something you enjoy and go for it. Most important of all though: don't let excuses get in the way. Where there is a will there is almost always a way. You can do it.